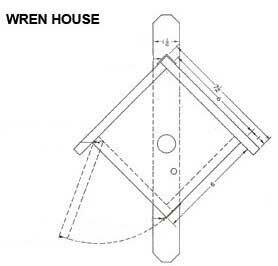 Free plans for building a wren bird house. When all other song birds fail to take advantage of a house built for them, the wren may still be counted on. Almost any sort of home from a tin can or hollow gourd on up is satisfactory if put in a safe place and provided with an opening 1" or slightly less in diameter, so the sparrows stay out. While the surfaces of lumber used for these houses may or may not be planed, care must be taken to insure that all pieces are sawed or planed to the correct sizes with edges and ends square and true so there will be no bad cracks for drafts and rain to enter. Almost any sort of lumber may be used, but birds take most readily to that which has been weathered out of doors. White pine and cypress meet these requirements and are worked with ease. Be careful when nailing the pieces together so that they will not have a chance to crack or warp. 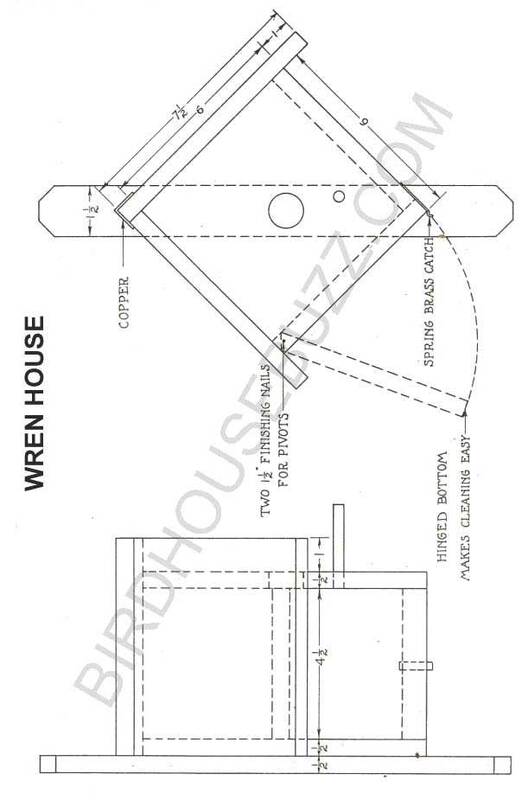 A good way to save time and lumber is to prepare a piece of stock, getting it of the right thickness, width and length, and then to saw up this stock on lines carefully laid out as shown in the drawings of the wren house. The wren house is designed with a hinged bottom for easy cleaning. The bottom is hinged on two screws or nails, and held in proper place by a dowel; or screwed in place; or hinged and held in place by a brass spring. With just a few tools you could have your own wren house.